For other uses, see Doral (disambiguation). Doral is a city in Miami-Dade County, Florida, United States. One of thirty-four municipalities in the county, it is located just one mile (1.6 km) from Miami International Airport and 13 miles (21 km) from Downtown Miami. The city regularly hosts in excess of 100,000 people who work in Miami. The City of Doral occupies a land area of 15 square miles (39 km2) bordered on the west by the Ronald Reagan Turnpike, to the north by the Town of Medley, to the east by the Palmetto Expressway and to the South by the City of Sweetwater. Doral is a principal city of the Miami metropolitan area, which was home to an estimated 6,012,331 people at the 2015 census. "Live, Work, Learn and Play!" Doral is sometimes nicknamed, "Doralzuela" for its large Venezuelan population, which began moving to Doral in earnest around the time of Doral's incorporation in 2003. In 2013, it was estimated that about 28% of the population of Doral was of Venezuelan descent, the largest concentration of Venezuelan expatriates in the US. In the late 1950s, real estate pioneers Alfred and Doris Kaskel purchased 2,400 acres of swampland between Northwest 36 Street and Northwest 74 Street and from Northwest 79 Avenue to Northwest 117 Avenue for about $49,000, intending to build a golf course and hotel. In 1962, the Doral Country Club opened in western Dade County, featuring the blue, red and par-3 golf courses, along with a hotel on Miami Beach. The "Doral" name combined Doris and Alfred. As Doral's very first structure, the Doral Hotel and Country Club became the area's hot spot: guests were transported from the beach to the country club for a day on the golf course. In the second year of operations, the Kaskels hosted the first Doral Open Invitational, Florida's major PGA event. Alfred offered $50,000 in prize money to attract well-known golfers. According to the South Florida Golf Foundation, at the time only three other tournaments were held in Florida, offering a combined total of $65,000 prize money. By the early 1980s, Doral started to experience its first residential growth spurt, when Alfred's and Doris' grandson Bill developed Doral Estates, followed by a joint venture with Lennar Corporation to build Doral Park. Both communities were named after the hotel, a trend that was to be repeated many more times. Although younger families started flooding the area, there were no stores, schools, or parks. Initially, most new homes were investment properties or second homes, but early full-time residents started coming together as a community. From 1983 to 1985, Miami-Dade County imposed a building moratorium to protect the area's water wells. Once the ban was lifted, Doral experienced tremendous growth. In 1989, Morgan Levy helped organize the West Dade Federation of Homeowner Associations to stand strong against any proposals that threatened the community's welfare. Thus, they secured a police station instead of a jail, as well as convinced county officials to implement higher development standards as well as more lighting, roads and landscaping. In 1995, residents began lobbying for incorporation in earnest, dissatisfied with the high tax rate relative to the services they received, as well as unchecked growth. The county met the first attempt at incorporation with a year's deferral. Some classified Doral as a "donor community," meaning that the taxes paid were more than the cost of operations. With the deferral, incorporation efforts intensified even more. In 1996, the community elected its first community council: Jose "Pepe" Cancio, Sr., Mario Pita and Barbara B. Thomas were elected and three other members were appointed. The council initially met once every month. In 2002, Governor Jeb Bush appointed Cancio to fill the remainder of Miami-Dade Commissioner Miriam Alonso's term of office. Doral residents hoped that his appointment would bring the community closer to incorporation, and their hopes were realized. Although Cancio endorsed Juan Carlos Bermudez, the City of Doral's first elected Mayor, as his replacement on the Community Council, Bermudez declined the offer, ran for the seat and was elected. At the time, Bermudez was president of One Doral, a civic organization formed to counteract the perceived influence of the West Dade Federation on the new Council. However, both One Doral and the West Dade Federation proved essential to the incorporation process. In January 2003, following a seven-year battle, 85% of Doral's voters voted in favor of incorporation. In June of the same year, 92% voted to accept the City Charter and elected their first Mayor and City Council. The new City of Doral was named as an attractive location for entrepreneurs with an interest in the Latin America market. Mayor Luigi Boria, elected in November 2012, became the second Venezuelan-American mayor in the United States. He was replaced by Juan Carlos Bermudez who won a reelection bid in 2016. The city of Doral has its own newspaper, "Doral Community Newspapers, which is published bi-weekly and is part of Miami Community Newspapers. Also, ''The Miami Herald and El Nuevo Herald publish from their headquarters in Doral. Doral is located at 25°48′29″N 80°21′12″W﻿ / ﻿25.808145°N 80.353322°W﻿ / 25.808145; -80.353322. According to the United States Census Bureau, the city has a total area of 13.6 square miles (35 km2). 13.2 square miles (34 km2) of it is land and 0.5 square miles (1.3 km2) of it (3.52%) is water. As of the 2010, there were 17,785 households out of which 14.3% were vacant. As of 2000, 38.0% had children under the age of 18 living with them, 57.0% were married couples living together, 9.5% had a female householder with no husband present, and 28.6% were non-families. 22.2% of all households were made up of individuals and 1.7% had someone living alone who was 65 years of age or older. The average household size was 2.66 and the average family size was 3.12. In 2000, the city population was spread out with 25.1% under the age of 18, 7.7% from 18 to 24, 43.6% from 25 to 44, 18.7% from 45 to 64, and 4.8% who were 65 years of age or older. As of 2000, the median age was 33 years. For every 100 females, there were 97.8 males. For every 100 females age 18 and over, there were 96.0 males. In 2000, the median income for a household in the CDP was $53,060, and the median income for a family was $57,193. Males had a median income of $46,324 versus $32,827 for females. The per capita income for the CDP was $27,705. About 9.5% of families and 11.7% of the population were below the poverty line, including 14.8% of those under age 18 and 10.6% of those age 65 or over. As of 2000, speakers of Spanish as a first language accounted for 74.50%, while English accounted for 16.15%, Portuguese was spoken by 5.02%, Chinese made up 0.98%, Tamil at 0.64%, Japanese at 0.53%, and Arabic was the mother tongue for 0.50% of the population. As of 2010, Doral had the second-highest percentage of Venezuelans residents in the US, with 8.22% of the population. It had the thirty-third highest percentage of Cuban residents in the US, at 15.20% of the city's population, and the sixth-highest percentage of Colombian residents in the US, at 8.71% of the its population. It also had the tenth-most Peruvians in the US, at 2.95%, while it had the forty-eighth-highest percentage of Dominicans, at 2.64% of all residents. It had the thirteenth-highest concentration of Brazilians, with 2.50% of the city (tied with Newark, NJ and Oak Bluffs, Massachusetts.) Doral's Nicaraguan community had the twenty-sixth-highest percentage of residents, which comprised 1.69% of the population. It is also home to the fifty-first-highest percentage of Ecuadorian residents, which made up 1.18% of the population. In 2005 Doral had over 10,000 businesses. During that year Carnival Cruise Lines, Ryder, and Univision had operations in Doral. For years leading into 2005, Doral attracted businesses of various sizes. Carnival Corporation and subsidiary Carnival Cruise Lines have their headquarters in Doral. In addition, Amadeus North America, AAXICO, Benihana, and Perry Ellis International have their headquarters in Doral. The Federal Reserve Bank of Atlanta Miami Branch Office, one of the five Federal Reserve Bank of Atlanta branch offices, is located in Doral. 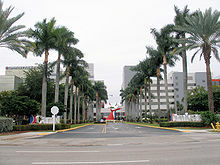 Martinair operates its Americas headquarters in the Doral Corporate Center One in Doral. Avianca operates a Miami-area sales office in Doral. Grupo TACA operates a Miami-area TACA Center in Doral. El Al has its Miami-area office in Doral. Hellmann Worldwide Logistics has its USA head office in Doral. Before Doral was incorporated, the second (1996–1998) Pan American World Airways had its headquarters in Doral. At one time Ryder had its headquarters in Doral. In 2002 Ryder announced that it would move its headquarters to a new site in Miami-Dade County. Portions of CSI: Miami episodes were filmed at CBS' Doral studios, which is home to its owned-and-operated affiliate, WFOR-TV, as well as MyNetworkTV affiliate WBFS-TV. In September of 2017, Doral published a comprehensive economic study which noted that "The City is home to 6,802 establishments employing 102,235 workers. The total volume of sales revenue from these companies, concentrated in such a small geographic area, represents $679,634 per worker, or over $1.35 million per resident making Doral one of South Florida’s and the State’s most productive local economies." The Doral Police Department was started on June 2, 2008, with 93 officers to service the growing Doral area. Previously, the Miami-Dade Police Department would service the area with a sticker on the side of the car showing the Doral logo. From its inception, the new police service has started a routine of parking at busy intersections or roadsides in an effort to catch speeders, thus forcing the entire city to slow down its speed on its once fast streets. On January 20, 2015, former basketball star Shaquille O'Neal was sworn in as a reserve police officer for Doral's police force. The Miami-Dade Police Department has its headquarters and the Midwest District Station in Doral. The Miami-Dade Fire Rescue Department has its headquarters in Doral. The Florida Department of Law Enforcement operates the Miami Regional Operations Center in an unincorporated area that was formerly a part of the Doral CDP and is not within the city limits of Doral. The National Transportation Safety Board operates the Miami Aviation Field Office in Doral. The United States Postal Service operates the Doral Branch Post Office in Doral. The City of Doral Trolley was launched on February 1, 2008 and has been available to residents and visitors alike for a convenient free ride. The pilot program involved a weekday route that ran from 7:00 am to 7:00 pm with one trolley servicing one route. Since then, the City has added five new trolleys and has expanded service with two additional routes, one of which connects to the Metrorail. Currently the system has three routes serviced by seven trolleys. Doral is a part of the Miami-Dade County Public Schools system. The Miami-Dade Public Library System operates the Doral Branch, which had re-opened on July 5, 2003 after an expansion, in the Doral Isles Shopping Center. In addition the system operates the 7,500-square-foot (700 m2) International Mall Branch in Doral. The library was the second to be built after the opening of the Main Library in 1985. ^ "100 Best Places to live and launch – 51. Doral, Fla. (51)". www.cnnmoney.com. Retrieved April 15, 2008. ^ a b c d "Doral History · City of Doral". www.cityofdoral.com. Retrieved May 3, 2018. ^ "100 best places to live and launch - 51. Doral, Fla. (51) - FORTUNE Small Business". CNN Money. July 2, 2008. Retrieved September 25, 2017. ^ "Contact Us." The Miami Herald. Retrieved on January 24, 2014. "The Miami Herald 3511 NW 91 Ave. Miami, FL 33172"
^ "Contáctenos Archived January 25, 2014, at the Wayback Machine." El Nuevo Herald. Retrieved on January 24, 2014. "El Nuevo Herald 3511 NW 91 Ave. Miami, FL 33172"
^ "MLA Data Center Results for Doral, Florida". Modern Language Association. Retrieved November 19, 2007. ^ "Ancestry Map of Venezuelan Communities". Epodunk.com. Retrieved November 19, 2007. ^ "Ancestry Map of Cuban Communities". Epodunk.com. Retrieved November 19, 2007. ^ "Ancestry Map of Colombian Communities". Epodunk.com. Retrieved November 19, 2007. ^ "Ancestry Map of Peruvian Communities". Epodunk.com. Retrieved November 19, 2007. ^ "Ancestry Map of Dominican Communities". Epodunk.com. Retrieved November 19, 2007. ^ "Ancestry Map of Brazilian Communities". Epodunk.com. Retrieved November 19, 2007. ^ "Ancestry Map of Nicaraguan Communities". Epodunk.com. Retrieved November 19, 2007. ^ "Ancestry Map of Ecuadorian Communities". Epodunk.com. Retrieved November 19, 2007. ^ "COMPANIES FLOCK TO DORAL." Miami Herald. April 23, 2005. 33WW Special Edition. Retrieved on January 9, 2010. ^ "Corporate Address." Carnival Cruise Lines. Retrieved on January 9, 2010. ^ a b c "Map of the City of Doral." (Archive) City of Doral. Retrieved on September 16, 2012. ^ "How to Contact Us Archived January 2, 2010, at the Wayback Machine." AAXICO. Retrieved on January 9, 2010. ^ "Contact Us." Benihana. Retrieved on January 24, 2014. "Benihana Inc.[...]8750 NW 36th Street Suite 300 Doral, FL 33178"
^ Walker, Elaine. "Doral, Fla.-Based Benihana Discloses Secret of Its Success." Knight Ridder/Tribune Business News. May 26, 1999. Retrieved on January 9, 2010. ^ "Franchising Contacts Archived April 30, 2010, at the Wayback Machine." Benihana. Retrieved on January 9, 2010. ^ "Contact Us Archived January 5, 2010, at the Wayback Machine." Perry Ellis International Corporate Apparel. Retrieved on January 9, 2010. ^ "Contact Us Archived November 5, 2010, at the Wayback Machine." Perry Ellis International. Retrieved on January 9, 2010. ^ "Miami Branch." Federal Reserve Bank of Atlanta. Retrieved on September 3, 2011. "9100 N.W. 36th Street Miami, Florida 33178-2425"
^ "Worldwide Offices Archived March 26, 2008, at the Wayback Machine." Martinair. Retrieved on March 8, 2009. ^ "Doral Corporate Center." Hines Interests Limited Partnership. Retrieved on September 6, 2009. ^ Bowden, Marilyn. "Hines buys Doral Corporate Center for $55.75 million." Miami Today. Week of December 7, 2006. Retrieved on September 6, 2009. ^ "Offices rest of the world[permanent dead link]." Avianca. Retrieved on January 27, 2009. ^ "TACA Offices." Grupo TACA. Retrieved on January 27, 2009. ^ "Hellmann Head Office USA Archived July 23, 2011, at the Wayback Machine." Hellmann Worldwide Logistics. Retrieved on November 6, 2010. ^ Ostrowski, Jeff. "Codina, Swerdlow set sights on Sawgrass Mills." South Florida Business Journal. Friday March 28, 1997. Retrieved on May 23, 2009. ^ "Contact Ryder." Ryder. Retrieved on January 9, 2010. ^ Tamen, Joan Fleischer. "Ryder Headquarters to be Located Near Broward County, Fla., Border." South Florida Sun-Sentinel. December 5, 2002. Retrieved on January 9, 2010. ^ "Economic Study Assessment · City of Doral". www.cityofdoral.com. Retrieved February 6, 2019. ^ "Police Services." Miami-Dade County. Retrieved on March 12, 2010. ^ "Doral Police To Be Sworn In[permanent dead link]." WPLG. Friday May 9, 2008. Retrieved on March 12, 2010. ^ Madan, Monique O. (January 20, 2015). "Shaq is back on a police force – this time in Doral". Miami Herald. Retrieved August 20, 2017. ^ "Miami-Dade Police." Miami-Dade County. Retrieved on September 9, 2012. "Miami-Dade Police Department 9105 NW 25 ST Doral, Fl 33172"
^ "Midwest District Station." Miami-Dade Police Department. Retrieved on September 8, 2012. "9101 NW 25th Street Doral, FL 33172"
^ "Contact Us." Miami-Dade Fire Rescue Department. Retrieved on September 8, 2012. "Miami-Dade Fire Rescue Department 9300 N.W. 41st Street Miami, Florida 33178-2414"
^ "FDLE Regional Contacts Archived April 1, 2010, at the Wayback Machine." Florida Department of Law Enforcement. Retrieved on March 7, 2010. ^ "Doral CDP, Florida[permanent dead link]." (Archive) U.S. Census Bureau. Retrieved on January 9, 2010. ^ "Post Office Location – DORAL BRANCH[permanent dead link]." United States Postal Service. Retrieved on May 5, 2009. ^ "Doral Trolley". City of Doral. Archived from the original on May 8, 2015. Retrieved March 29, 2015. ^ "Facilities and Rentals". City of Doral. Retrieved August 20, 2017. ^ "Doral Fact Sheet: Education". www.cityofdoral.com. Archived from the original on December 19, 2007. Retrieved January 10, 2008. ^ "Doral Branch[permanent dead link]." Miami-Dade Public Library System. Retrieved on February 26, 2010. ^ "International Mall Branch[permanent dead link]." Miami-Dade Public Library System. Retrieved on February 26, 2010. ^ "Doral". Divine Savior Church.